After waiting 22 years to return, my amazing trip to India was nearing its end. The group of students, along with my former professor, had become incredibly close during this time and I was enjoying having people to share my days. My emotional and spiritual release from my pending divorce and other losses was taking on a life of its own, of which I was not yet conscious. On day nine of the trek in the Himalayas, we arrived at Lake Chandra Tal for a day of rest before proceeding up to 16000 ft. The beauty of this place was breath taking and the day of rest was a welcome relief as was the opportunity to bathe for the first time on the trek. Diaper wipes had served me well so far and full immersion in water sounded divine, no matter how frigid that lake would be. I felt refreshed and rewarded for the long hike we had endured to this place at 14,000 ft.
That night, sitting by the glassy lake at sunset, I realized that in this place and time I was living a conflict free existence for the first time in almost 2 years. I felt the safety and serenity of my life here and sought to breathe this peace deep into my heart and soul. The sunset turned red, the sky ablaze with color, and then the full moon began its rise in the sky. I felt deeply what I had accomplished on this trek and a deep peace filled my heart. I prayed to Spirit, “Make me happy, wild and free” and knew in my heart that eventually it would be so. The last day of the trek to Kunzum Pass just past our peak at 16000 ft. was challenging. My muscles were deeply tired, my feet shuffled and at times I stumbled on rocks on the path. The landscape was rocky and desolate, uninhabited for ¾ of the year, and that emptiness left me feeling hollow as I climbed. I was trusting more than ever that I would have what I needed as I continued, chanting affirmations to myself at my slow and steady pace. At one point, I looked up to see an eagle soaring through the pass I was crossing. I saw her lightness and freedom and felt it was a sign of encouragement. My steps became stronger and my feet moved more easily after seeing her there. At Kunzum Pass, where the Dalai Lama is flown in via helicopter to teach his followers, I knew I had finally made it. The terrain was rugged and the sky was a bright blue with clouds so close it seemed as if you could touch them. The pass was framed by the tattered peace flags hung by pilgrims who had come before. Snow capped peaks in the distance reminded us of the snow that is here most of the year. The effects of the altitude were breath taking, literally and figuratively. The air was thin and my breath was hard to catch. I found I could not even grip the lid of my water bottle to twist off the lid because my muscles were not getting the oxygen I needed to function normally. I knew it would take time for my body to acclimate to the conditions and I waited patiently. Some students were retching from having hiked too fast to this place and I was grateful to not be one of them. My own slow and steady way had served me well. As I acclimated in the quiet reverent, serenity of this place, I remembered that I had placed a picture of the Dalai Lama in my home during the harsh days of my divorce to encourage me to be courageous and stand for what I believed to be right without warring. With this remembrance, I went into soulful reflection in, I prayed and asked the Dalai for continued support and strength to get through the last of my settlement negotiations. As I circled his chair, I heard inside that what I needed to get through was ‘fierce and strong compassion for myself’. Tears of joy and blessing came as I recognized that I had not been compassionate enough with myself through this process and to give that to myself would allow me to give it to others. 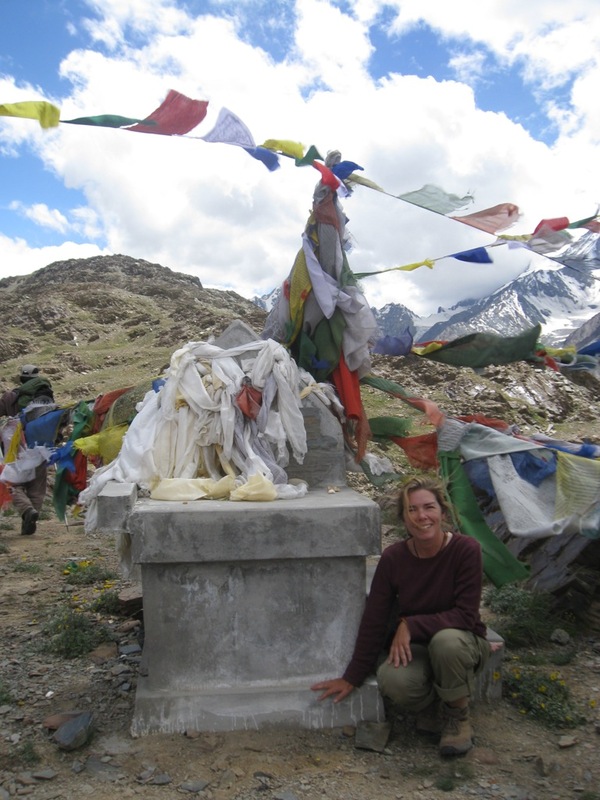 With deep thanks, an offering, and a Namaste, I left Kunzum Pass satisfied my dreams were coming true thanks to my open heart and the support of the Universe. Coming down out of the mountains back into the cities of India with the people, noise and activity that surrounded us was an adjustment for all of us. I soon would be headed for Cornwall in England and wondered how that cultural shift would be for me. It was with bittersweet anticipation that I left India.